One of the all-time great boxing movies, Body and Soul (1947) instantly became the template even for the great ones that followed. Champion and The Set-Up (both 1949) told similar stories, while The Harder They Fall (1956), also excellent, is practically a remake of Body and Soul only told from the perspective of a cynical publicist rather than the fighter. Body and Soul's climatic match, photographed by the great James Wong Howe, has been imitated endlessly; watch it and you'll know where much of Raging Bull (1980) originated. The film was well regarded upon its release. Star John Garfield was Oscar-nominated for his leading performance, as was Abraham Polonsky's original screenplay, while it won in the Best Editing category. But the film quickly became a veritable Who's Who of blacklisted talent, victims of anticommunist paranoia and self-serving politicking. Producer Bob Roberts, screenwriter Polonsky, Garfield, co-stars Anne Revere, Lloyd Gough, Art Smith, Shimen Ruskin, and Canada Lee all were blacklisted, and James Wong Howe was greylisted. Director Robert Rossen originally refused to testify before HUAC but later named 57 names to salvage his career. Ironically, the film is also noteworthy for all the future film and television directors who worked on it: actors William Conrad and Joseph Pevney, art director Nathan Juran, assistant director Robert Aldrich, script supervisor Don Weis, etc. Filmed in black-and-white and presented in its original 1.37:1 full-frame format, Body and Soul's transfer looks great. While one can see softness in dissolves, fades, and other process work, including several optically printed close-ups, straight cuts offer amazing detail and clarity like never before. The film begins in the present day, but most of its story is told in flashback, working its way back to the present for the climax. Middleweight boxing champion Charley Davis (John Garfield) wakes from a nightmare and, the night before the biggest fight of his career, visits his unsympathetic mother (Anne Revere), ex-fiancée, Peg Born (Lilli Palmer), and, finally, current gold-digger/sultry nightclub singer girlfriend, Alice (Hazel Brooks, later a respected still photographer). Later, his crooked manager, Roberts (Lloyd Gough, billed here as "Lloyd Goff," a phonetic reading of his family name), discusses the fixed bout, for which he instructs Davis to go 15 rounds and win by decision. At this point Davis recalls how he got to this point, how he met aspiring Greenwich Village painter Peg, how his father (Art Smith) was killed when the speakeasy next-door was bombed, and how family friend Shorty Polaski (Joseph Pevney) was the first to recognize and promote Davis's talent. He later partners with Quinn (William Conrad, very good) who in turn sells Davis to Roberts. Body and Soul is chiefly concerned with Davis's search for validation via wealth (fame not so much), of his naïve dismissals and, later, outright refusal to accept that his success comes at too high a price, that his is a success earned illegitimately. Those truly loyal to him - Peg, Shorty, and his mother - can only watch helplessly as he rationalizes the inexcusible. If Body and Soul has dated that's only because it was so influential other boxing pictures have struggled to avoid copying genre conventions it refined, as well as its visually innovative fight scenes. Some of the screenplay's dialogue is terrific, made even better by the performers. One especially good scene, for instance, has Davis, after a wild but soulless night of partying, visiting his estranged ex-fiancée at her apartment. He wants her pity and sympathy but she resists being taken advantage of, pointing to past infrequent visits done out of his loneliness or his insecurity, not hers. He tries manipulating her without even realizing it, while she, the stronger of the two, knows him much better than he does. Where Body and Soul falls a bit short is in explaining to the audience just what drives Davis's obsession for wealth, why he burns through it so fast when he gets it, and why he refuses to accept the obvious. Clearly, the hand-to-mouth existence of his parents and their candy store, his father's murder (by implication the same gangsters who'd later exploit Davis) is part of this. Late in the film Davis's explicit Jewishness is introduced as a factor: his Jewish neighborhood regards him as a morale builder while across the ocean the Nazis are trying to wipe out their families there. But mostly it's Garfield's superb performance, one of his best, which subtly fills in the deficiencies of Polonsky's script. It's easy to read too much into Communist Polonsky's script. Long before this boxing movies featured crooked racketeers exploiting fighters they regarded as little more than commodities to be bought and sold, and who often get rich fixing fights. (The 1937 Kid Galahad immediately comes to mind.) But the screenplay, direction, and acting refine these genre conventions in interesting ways. In Body and Soul, the screenplay contrasts Davis, who rationalizes every payoff, with black boxer Ben Chaplin (Canada Lee, in an excellent performance), who refuses Roberts's dirty money and Davis's attempts at charity, though he does later go to work for him. Body and Soul never looked particularly good on home video before now, possibly because rights changed hands several times over the decades. Originally an independent production for release through United Artists, it passed to MGM at some point (see poster above) and Republic before residing at its current home, Paramount. Sublicensed to Olive Films, the Blu-ray version is pretty stunning; one can almost feel the material of Garfield's and Gough's tailored suits and smell the sweat dripping off the fighters' faces. At the 1:22 mark there's about a minute-and-a-half where clearly they had to resort to inferior elements, but that's a minor complaint at worst. The audio (English only, no subtitles) is likewise quite good. No Extra Features, sorry to say, owing to Paramount's general unwillingness to sign off on independently produced extra features content. 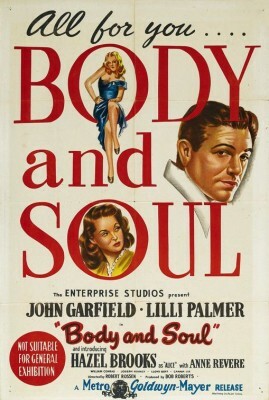 Hugely influential, Body and Soul seems familiar only because of the dozens of films influenced by it, yet on its own terms still holds up extremely well, thanks particularly to star John Garfield's performance, and the still-exciting climatic bout, dazzlingly photographed by James Wong Howe. A DVD Talk Collector Series title.